Kimi Raikkonen's debut in the World Rally Championship came to an end after the former Formula 1 champion crashed out of stage 19 of the Rally Finland. 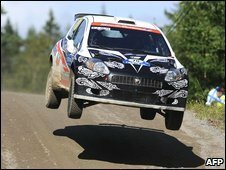 The Finn was 15th overall when he rolled his Abarth Grande Punto off the road on Saturday's final stage. He and co-driver Kaj Lindstrom were unhurt, although they narrowly missed the car of Mads Ostberg who had gone off at the same point moments earlier. The damage to Raikkonen's car prevented the Ferrari driver returning on Sunday. Raikkonen has appeared in three non-championship rallies this season, and a four-week break between the Hungarian Grand Prix and the European Grand Prix in Valencia on 21 August has allowed him to step up his involvement. In a disappointing F1 season, Raikkonen has won just 10 points in the drivers' championship and 54 behind leader Jenson Button. But his speed in the second-tier Super 2000 machine impressed as he climbed up to third in the category before his error ended his race. Raikkonen's compatriot Mikko Hirvonen secured a victory for the home fans coming home 25 seconds ahead of title rival Sebastian Loeb. World champion Loeb, who lost more than 10 seconds after damaging his rear tyre in a pothole on a hairpin on stage 15, now trails Hirvonen by three points in the overall standings. Raikkonen was not the only F1 driver at the Finland Rally with Red Bull driver Sebastian Vettel watching from the sidelines. "I've plenty to do in F1, but who know maybe one day I will compete in the WRC - I wouldn't mind doing some drives in the future," Vettel told the World Rally Championship website.